What is Presidents' Day anyway? Who exactly are we supposed to be celebrating? Washington? Lincoln? Anyone else? At a federal level, the holiday is Washington’s Birthday. The name “Presidents’ Day” is the result of individual states asserting their own preferences as well as advertisers popularizing their version of the holiday as an excuse to sell sundry items, notably mattresses. Numerous states have renamed the holiday (Presidents’ Day, Washington & Lincoln Day, etc.) and created their own traditions. Some states celebrate all presidents, some just Washington, and others various combinations of presidents. Some states even honor people who are not presidents; Arkansas celebrates civil rights activist Daisy Bates along with George Washington. The states play fast and loose with the apostrophe (President’s/Presidents’/Presidents), with not all of them strictly abiding by the rules of English grammar. In California we place the apostrophe after the S.
Since some presidents (Washington and Lincoln in particular) hog all the press, let’s take this occasion to recall a few of the less discussed commanders-in-chief and look back on a small selection of the rogues, goofballs and weirdos who have occupied the oval office. Soon to be scrubbed from the $20 bill, Andrew Jackson is one of America’s most notorious and controversial presidents. Among his lesser known dubious doings was the nationalization of the “spoils system”, the practice of awarding public offices to political allies. This system lay fertile ground for corruption, enabling numerous unqualified people to buy themselves into positions of power. Jackson’s most infamous appointee under the spoils system was Samuel Swartwout, customs collector for the port of New York. Swartwout eventually fled the country, leaving public coffers short over a million dollars. He is the first person known to have stolen from the American government. Public attitudes toward Jackson shift with the times. These days he takes heat for his role in the forced relocation of Native Americans, but his relationship with the tribes was more complicated than is commonly portrayed. In fact, Jackson had adopted a native child and expressed concern over tribal welfare, entreating congress to do something to preserve “this much injured race”. Jackson believed it was “cruel and unjust to compel aborigines to abandon the graves of their fathers” and envisioned a country in which whites and Native Americans could live together. Relocation of the eastern tribes was originally intended to be voluntary, an invitation for them to move west of the Mississippi where they could live undisturbed. However, his proposal lay the groundwork for the Indian Removal Act of 1830 and led to the tribes’ forced uprooting. Furthermore, Jackson had underestimated the speed and force of Westward expansion; the land he had intended for Native Americans was encroached upon in the years that followed. Most famous today for his physical appearance, stiff collared, bald headed and prodigiously muttonchopped Martin (“Matty” or “Little Van”) Van Buren was the eighth POTUS and the first to be born after the formation of the United States. His reputation for superciliousness and incompetence owes itself less to truth than propaganda. In the election of 1840 the Whigs fallaciously portrayed their candidate, William Henry Harrison, as a hard drinking, hard cider loving, log cabin born man of the people. (In reality Harrison was well-off and allegedly preferred whisky.) Meanwhile they smeared Van Buren as a foppish, simpering aristocrat who snubbed commoners, lived in a palace, and was incapable of stomaching hard cider. 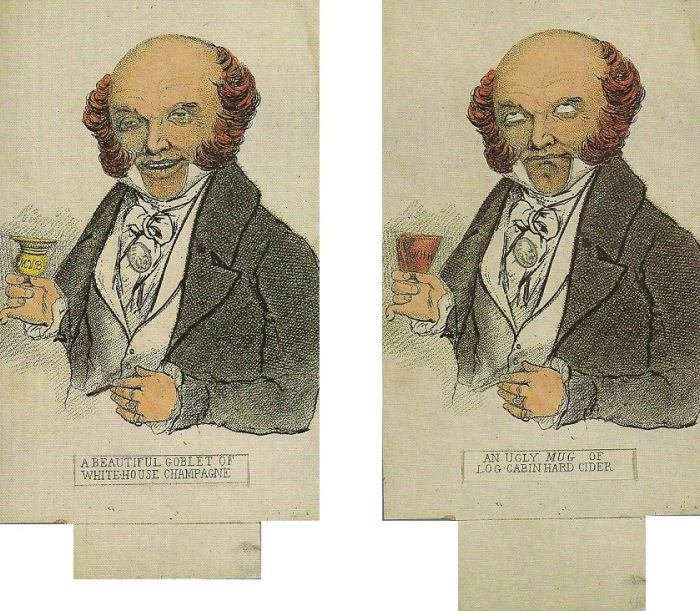 Image: Van Buren enjoys champagne and gags on hard cider. Van Buren had served as Vice president during Andrew Jackson's second term, and Jackson used his considerable political pull to shoehorn the not-so-popular Van Buren into office. As the new figurehead of the Jacksonian agenda, Van Buren inherited many enemies as well as incurring the disappointment of die hard Jacksonians who viewed him as a poor substitute for “Old Hickory”. Furthermore, he inherited a country on the brink of a financial crisis (brought about in part by Jackson’s policies) for which he was burdened with the blame. Van Buren left office on a low note, but he stayed in politics and made another bid for the presidency some years later as a candidate for the short lived Free Soil Party (whose platform opposed the expansion of slavery). In that election he carried not a single state! A tailor first and politician second, Tennessee born “Old Andy” Johnson was forever the center of drama. A champion of states' rights, Johnson nevertheless opposed southern secession, causing a scandal in Congress when he famously refused to secede along with his own state. He had an undeserved reputation for drunkenness, which began at his own vice presidential inaugural ceremony. He had been advised to take whisky to cope with a case of typhoid and had overestimated his tolerance. Dubbed “the accidental president”, Johnson inherited more trouble than he was prepared to handle when Lincoln’s term was cut short. Despite his anti-secession sentiments, his support of states’ rights put him at odds with a Republican dominated Congress determined to strongarm the southern states into cultural reform. He vetoed the Civil Rights Act of 1866, which granted American citizenship to all people born in the United States (freed slaves included), but an angry congress overrode the veto. This would happen on numerous subsequent occasions, causing his detractors to nickname him “Andy Veto” and “the dead dog of the white house”. Image: Johnson did not support the Freedmen’s Bureau, a organization established to provide land and education to black citizens following Emancipation. Here he is seen kicking the bureau out of Washington via his veto of the Civil Rights Act. Before the congressional election of 1866 Johnson embarked on a speaking tour to defend his positions. He did a poor job of it, so alienating the public that the elections that year resulted in a increase of the Republican majority to two thirds in both houses of Congress. Johnson’s refusal to cooperate with Reconstruction vexed Republicans so much that they made a bid for impeachment in 1868 on the grounds that Johnson had committed “high crimes and misdemeanors”. 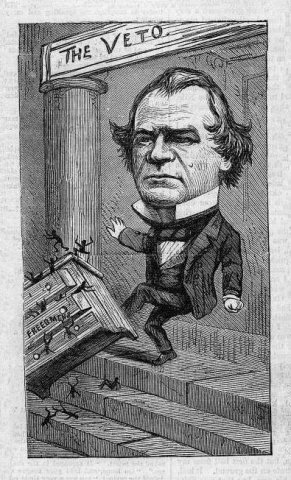 Open to the public, Johnson's impeachment trial sold more tickets than any other show that year, but Johnson survived to complete his term in 1869. One of the most forgotten presidents, Chester A. Arthur nevertheless cuts a compelling character. A wealthy wine enthusiast and fashionista rumored to own over 80 pairs of trousers, “Elegant Arthur” attained political prominence as the right-hand man of New York senator Roscoe Conkling. Reminiscent of the Obama birther fiasco, Arthur’s detractors insisted he was unfit for office because he had been born in Canada, a charge for which no evidence was forthcoming. Image: Senator Conkling was unhappy with Arthur's choice to work for Garfield. A major issue in Arthur’s time was the “spoils system” (one of the many questionable legacies of Andrew “Old Hickory” Jackson), the practice of filling civil service positions with political allies. Arthur’s former employer, Senator Conkling, was a proponent of this system, and it was widely assumed the Arthur was too. Arthur served as vice president under James A. Garfield for less than a year before Garfield was assassinated. The assassin identified himself as a supporter of the spoils system and claimed he had committed the assassination so that Arthur would become president. The joke was on the killer, however. Once president, Arthur turned his back on the spoils system and his old cronies, promoting legislation to increase standards for civil service appointments. Kentucky statesman and three time loser Henry Clay famously said “I’d rather be right than be president.” Indeed, the characters covered here suggest that wrongness (or at least goofiness) is a prerequisite for the job. They also show us that the Washington of yesteryear was as sordid and rowdy as it is today. For more information on our U.S. Presidents- the good, the bad, and the ugly- check out our databases: U.S. History in Context and Biography in Context. For some Presidents’ Day fun, stop by Alum Rock Branch for storytime and crafts! Submitted by Shane Curtin on Wednesday, February 14, 2018 - 2:15 PM. Very interesting and informative post; enjoyable to read. There is no official federal "Presidents' Day". The hijacking of Washington's Birthday (the official federal holiday) by voracious capitalistic commercial interests in the middle of the last century is both despicable and laughable....people truly will do anything to make a buck. When you ask people what they associate with Washington's Birthday, many (most?) will say a nationwide mattress sale; and I'll wager most cannot tell you the century in which Washington was born, let alone the actual year of his birth. This man is the central iconic figure in the founding of the United States, yet we relegate his memory to a day off from work or school to go shopping. I hope we can count on librarians to be a bulwark against the further erosion of history in the minds of our citizens!